You may be getting a calling to book a Yoga Teacher Training Course. Maybe you don’t want to be a teacher but you would like the opportunity to explore your practice more deeply or perhaps you would love to teach and are looking for a suitable course. Here are a few useful steps to help your decision making process. Are you seeking an experience to transform your life and take you overseas to immerse yourself in the training? This may be an opportunity to step outside of your regular life, travel for your training and add travel adventures to your experience. You may have a particular yoga style you would love to teach. Research teacher training offering this particular style and explore the course content. Studying and building connections in your local community may be your intention. This is a wonderful way to make new like-minded friends in your community, get to know local teachers and find your roots in a supportive local community. You may have aspirations to train with a particular teacher that has inspired you and you can seek out where they are hosting teacher training course. Ensure that you do your research as you are investing into this course and need to make sure it is right for you. Ask what lineage the training comes from. Understand the learning objectives of the course and what skills you will learn. Seek out testimonials and ask previous students for their feedback. What does the course structure look like and what does a typical day look like. Find out the finer detail in terms of course content and topics covered. Who is teaching on the course and find out more about the teachers. What is the best structure for you? This is likely to be decided by your lifestyle, personal circumstances and learning style. A year-round, one weekend a month structure may suit you if you have family and regular work commitments. This may suit you if you prefer to learn over an extended time period in order to integrate your learning. Alternatively you may prefer learning in an intensive format and can find 4-6 weeks in your schedule to attend an intensive course. There in no right or wrong way here, it is all about personal choice. Spend time doing your research and consult with others to fully discuss your thoughts. It is important to remember this is the start of your yoga teacher training journey. Dive in and fully enjoy the experience but know that it could be the first of many. Your training needs may vary and develop over time so this is your first step on your journey. Either I have attended these courses myself, studied with the teachers, know the teachers delivering these courses or have received excellent recommendations from students that have attended. Devon School of Yoga was established in 1989 and offers a broad and comprehensive Yoga Teacher Training course. The school has a mix of teachers in the faculty with a broad range of skills and experience. Sheila offers a comprehensive in-depth curriculum with several levels of training available. You will study asana, pranayama and learn ways of engaging your students through careful class planning. The group provides the opportunity for discussion around the shared teaching experience. 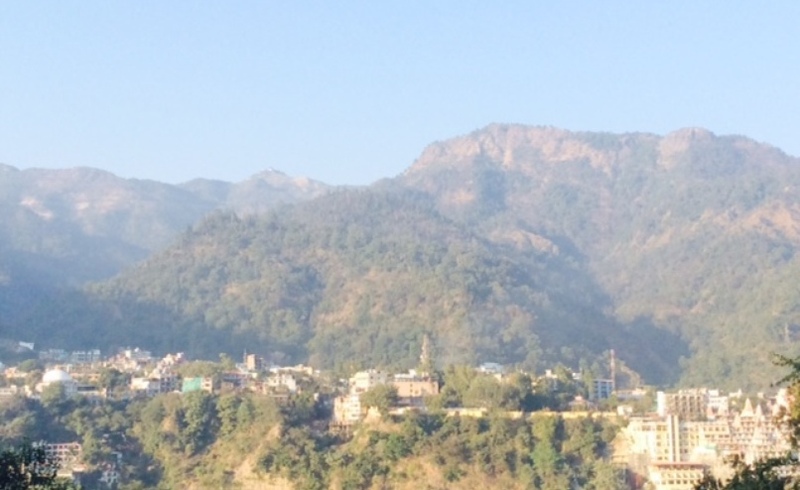 Yog Sundari offers a unique opportunity to study in the UK over 8 weekends and one week of study in Rishikesh. This holistic Yoga Teacher Training will give you a strong foundation, a wider understanding of yoga and the opportunity to deepen your practice. Intelligent Yoga Teacher Training is led by Catherine Annis and Tanya Love. This course has been created to develop knowledgeable, responsive and confident teachers who teach yoga based on a solid understanding of the fundamental workings of the body and an appreciation of its natural intelligence. Yoga Arts has been dedicated to training Yoga Teachers for over 24 years and is passionate about providing a high standard of teacher training. Ultimately the objective of the Yoga Arts’ trainings is to train participants in quality, professional, safe and knowledgeable teaching skills and to offer, the teacher to be, as many available teaching tools as possible so that their teaching can be available to everyone. Most importantly, to bring about self responsibility, self understanding, spiritual maturity and awakening to the student.The Yoga Arts’ trainings prepare the student on an inner reflective level to move towards a spiritual maturity and self-understanding. Train in the birthplace of Yoga with Himalayan Master Yogrishi Vishvketu at the uplifting east-meets-west Anand Prakash Yoga Ashram. Let us guide you to become a radiant and inspired holistic yoga teacher! Akhanda Yoga emphasises a balanced class including a full repertoire of yoga techniques sequenced artfully to align the layers of self. The style that is taught at the Frog Lotus Yoga Teacher Training Course in Spain is a joyful, creative and intelligent vinyasa flow style which can be easily adapted to different levels. 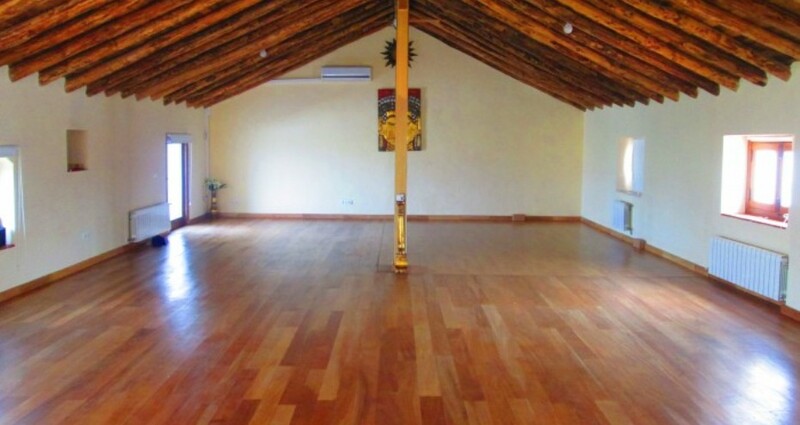 At the end of the Yoga Teacher Training Spain you will not only be qualified to teach vinyasa flow yoga but will also have the tools to create other styles of yoga classes, such as more basic hatha, prenatal and restorative yoga. Happy researching and enjoy your yoga journey! 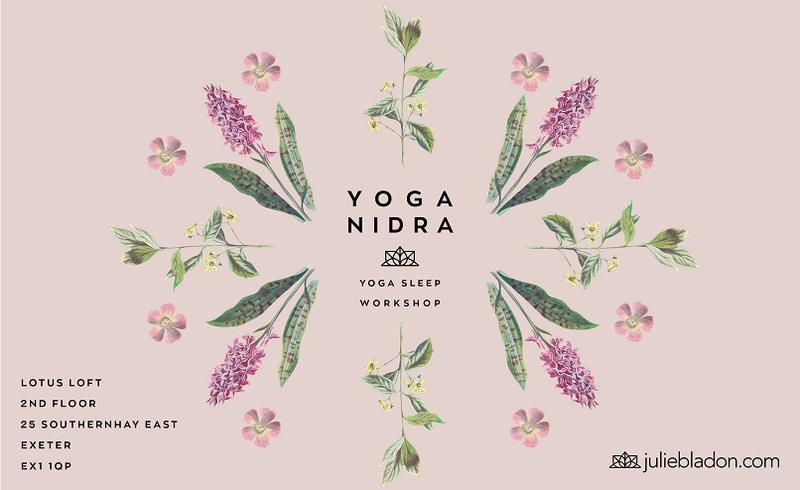 My designer niaski.co.uk has produced a beautiful range of flyers and business cards for my 2018 Yoga Nidra workshops. I will be teaching this popular workshop in three venues in 2018 – Lotus Loft, Exeter; Jala Flow Yoga, Sidmouth; and Yarner House, Bovey Tracey. 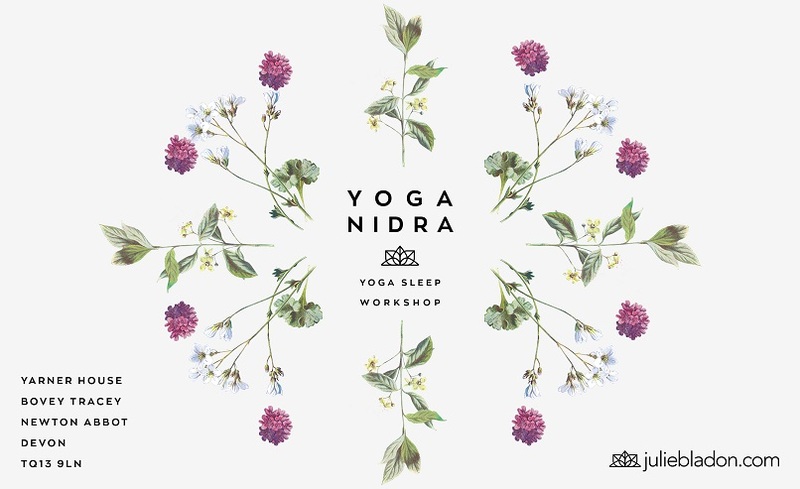 All of 2018 Yoga Nidra workshop dates are up on my website so you can plan the year ahead and book in for workshops. Simply search events by location, month or date. I am currently planning and writing a new range of Yoga Sleep downloads with a particular focus on women. I will let you know as soon as these are available for download and streaming. For Yoga Nidra and guided meditations online visit my YouTube Channel. 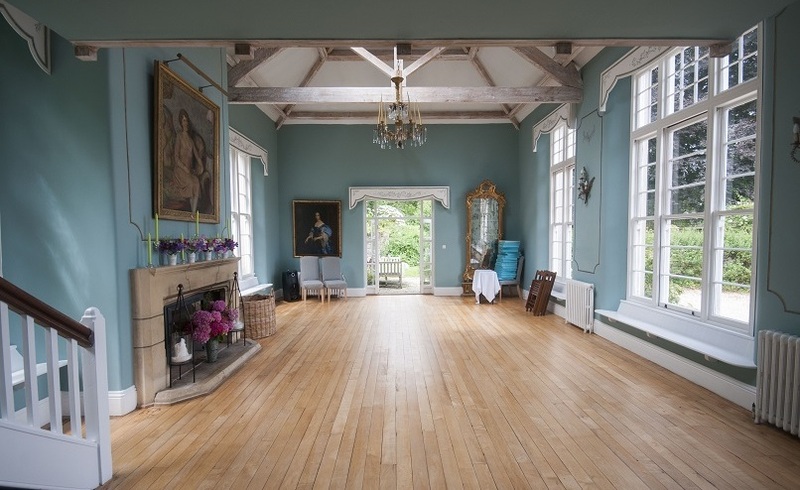 I have teamed up with Yarner House, Bovey Tracey to deliver a programme of Yoga Nidra workshops and yoga events. 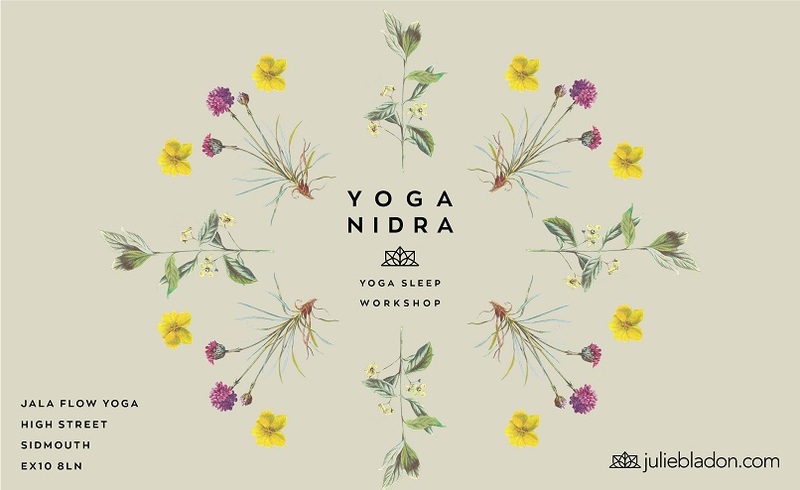 The first Yoga Nidra Workshop is on Sat 4 Nov, 10.30am – 12.30pm. You will enjoy a relaxing and calming meditative yoga practice before embarking on a Yoga Nidra journey. Yoga Nidra is an ancient tantric method where the mind and body is in deep relaxation. A single hour of Yoga Nidra is as restful as four hours of conventional sleep. This workshop is for anyone interested in relaxation and meditation, whether you are brand new or experienced in meditation. You will be fully guided. The practice of Yoga Nidra releases all types of muscular, emotional and mental tension. You not only enjoy complete physical, mental and emotional relaxation, but also get to explore the tremendous powers hidden in the deeper layers of subconscious mind. Approached by a wooded drive of nearly a mile long, this superb Scandinavian style manor house offers an extraordinary, luxurious experience. 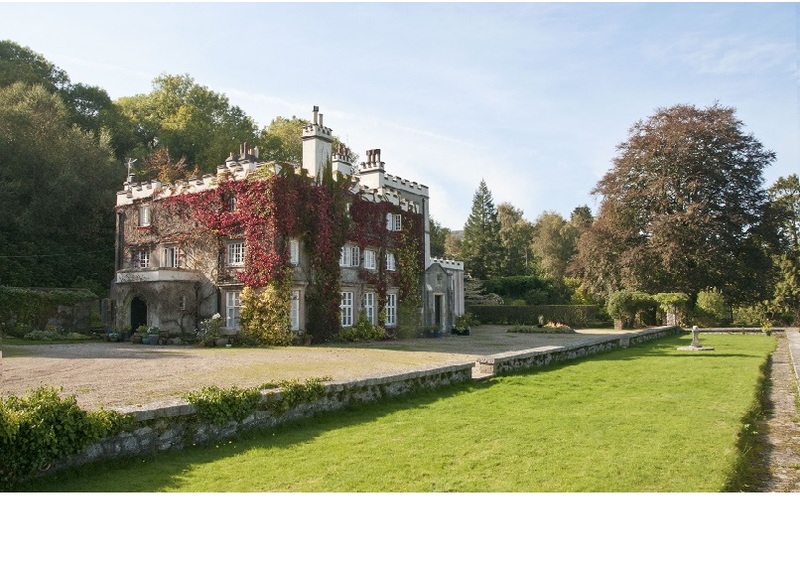 This magnificent property was built in the 16th century originally as a Tudor hunting lodge. The Yarner estate extends to just below the summit of Haytor, a beautiful granite Tor. Yarner’s grounds span just over 250 acres, a unification of working farm land and rural countryside, situated below Dartmoor, above Yarner Wood, a thriving ancient nature reserve. Yoga Nidra will take place in the Scandinavian Hall overlooking the panoramic view of the Wray Valley. 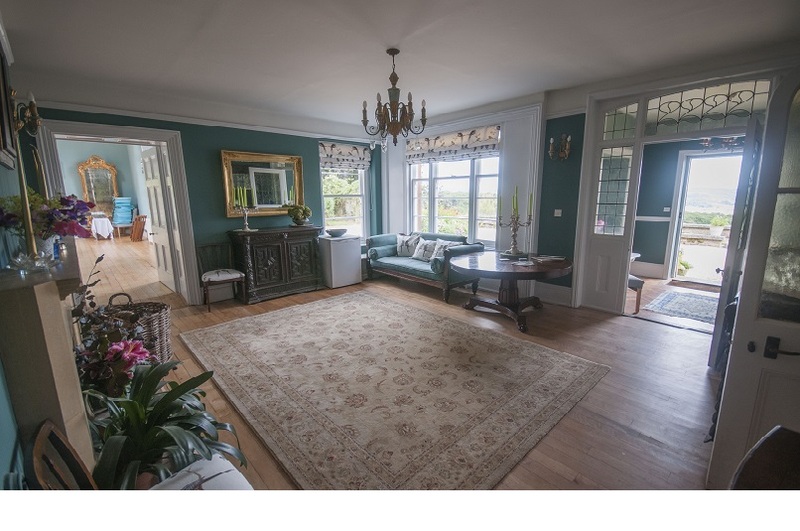 This stunning room has a delightful duck-egg blue and gold, Swedish style interior.Â You can enjoy the views from the immense ceiling to floor windows and the space has a large fire place with log burner to keep the room cosy in winter months. Tea and refreshments will be provided. Enjoy your cup of tea in Yarner’s dining room overlooking the Wray Valley. Bring your walking boots if you wish to head up to Haytor for a bracing walk or explore the ancient Yarner Wood after the workshop. To find out more about the venue visit Yarner.com. For enquiries please email info@juliebladon.com . The teaching in Patanjali’s Yoga Sutras is for the transformation of the whole of a human being – body, mind and soul. The first aim of yoga is the development of a steady attention. Difficulties and obstacles to this steady way of being are discussed in the Yoga Sutras and practices for transformation are suggested. 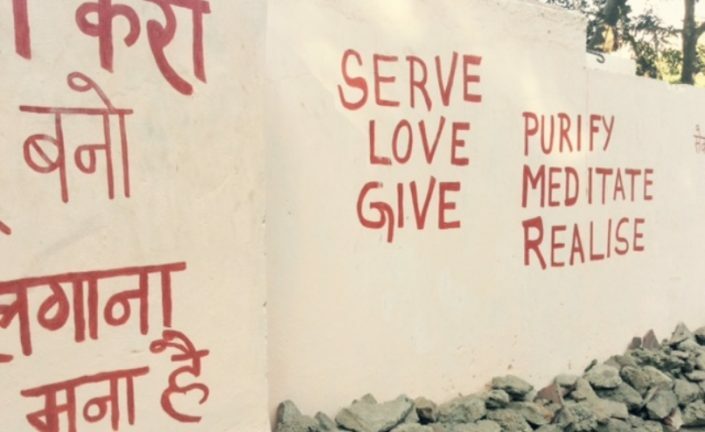 Patanjali’s Yoga Sutras offer wisdom and inspiration. Patanjali recommends the eight “limbs” or steps to quiet the mind and achieve a transformation of consciousness. Scholar Ravi Ravindra offers a fresh and direct translation of Patanjali’s text. The book contains extensive commentary and spiritual exercises. This is an insightful and informative book. It is a book that will be read and re-read with lessons gained every time. Stephen Cope; author, psychotherapist, leading American yoga teacher; unlocks the teachings of the Yoga Sutras and yoga wisdom by focusing on contemporary life. He analyses the lives of friends and fellow yoga students looking at a multitude of modern dilemmas such as career issues, relationship issues and dysfunctional family relationships. Looking at their life challenges, Cope brings to light some answers to the struggles experienced in life. Whilst some people think of yoga as a set of invigorating postures and breathing exercise, this book highlights that the physical practices of yoga are only part of this vast and ancient spiritual science. Yoga sages systematically explored the essential questions of our human existence: What are the root causes of suffering, and how can we achieve freedom and happiness? What would it be like to function at the maximum potential of our minds, bodies, and spirits? What is an optimal human life? Cope presents an easy to follow text that explores areas such as the path of inner development, practices to build character and mental power, practicalities for the process of awakening. This is a perfect guide for a more ethical and graceful way of living in the world. Easwaran’s best-selling translation of the Bhagavad Gita is readable and easy to follow. His introduction places the Gita in its historical context, presents key concepts, and brings out the universality and timelessness of its teachings. The book includes chapter introductions, notes and a Sanskrit glossary. Easwaran (1910-1999) grew up in the Hindu tradition in India, learned Sanskrit from a young age, and became a professor of English literature before coming to the West. He was a gifted teacher and an authority on the Indian classics and world mysticism. This translation is a timeless classic. Read it many times and you will discover new wisdom and information each time. Cope takes readers on a step-by-step guide of the revered tale the Bhagavad Gita, an ancient allegory about the path to dharma told through a timeless dialogue between the fabled archer Arjuna and his divine mentor Krishna. Busy daily life can sometimes leave you overwhelmed and uncertain about your life’s true path and purpose. Cope says that in order to have a fulfilling life you must discover the deep purpose hidden at the very core of your self. In “The Great Work of Your Life“, Cope describes the process of unlocking the unique possibility harboured within every human soul. The secret, he asserts, can be found in the pages of a two-thousand-year-old spiritual classic called the Bhagavad Gita. Cope makes the lessons of the Bhagavad Gita relevant for contemporary readers. He highlight well-known Western figures that have embodied the true dharma path and also uses every day stories to further illustrate the lessons of this classic tale. If you’re feeling lost in your own life’s journey, “The Great Work of Your Life“ may provide you with answers to the questions you most urgently need addressed—and may help you to find and to embrace your true calling. This book will offer you guidance and inspiration. It is a book that can be revisited on many occasions and is a good reminder to keep focused on your true path even when times may be challenging or confusing. In this book Nischala Joy Devi interprets Patanjali’s Yoga Sutras from a heart-centred, intuitive, feminine perspective resulting in the first translation intended for women. Devi’s interpretation captures the spirit of each sutra and offers practices to embrace the spirituality of yoga in your everyday life. This is a contemporary interpretation relevant to all yogis, male and female. Simplifying the teachings for use in everyday life. A poignant and thoughtful read perfect for aspiring yoga practitioners and any spiritual seekers. For many years at the Jivamukti Yoga School in New York City, popular and highly regarded yoga teacher Ruth Lauer-Manenti (affectionately known as “Lady Ruth”) has offered her students “dharma talks”—stories from her life that accompany her classes and represent the yogic commitments to ahimsa (non-violence), compassion, and service. Some of these dharma talks have now been collected in this book, many of them accompanied by a reading from classic Hindu texts, such as the Bhagavad Gita, The Hatha Yoga Pradipika, and The Yoga Sutras of Patanjali. Composed with humour and sensitivity, “An Offering of Leaves” is the perfect gift for the aspiring yoga practitioner and any spiritual seeker wanting to live with thoughtfulness and integrity. While in Bylakuppe, in Southern India, a territory that had been given over to Tibetan refugees, she was touched by the humble generosity of the Buddhist monks there. She connects this to a beautiful line in the Bhagavad Gita: “However humble the offering, be it a leaf, a flower, fruit or water, if it is made with love and devotion, I will accept it” (9: 26). This book is made with love and devotion to share teachings from the ancient yoga teachings. An easy read and reflecting on the joys and struggles of life. It inspires ways to lead a more thoughtful, compassionate life. This is a touching, universal, honest and humbling book. Yoga and Ayurveda offer surprising insights into the sources of insomnia. Read on to learn more—and then try 6 simple practices that can help you sleep better tonight. Our daily dose of shut-eye regulates our weight, strengthens our immunity, protects our cardiovascular health, repairs our tissues and cells, and restores our energy. According to The Yoga of Herbs by Vasant Lad and David Frawley, nutmeg is “one of the best medicines for calming the mind.” This common kitchen spice helps reduce high vata in the colon and nervous system and promotes sound sleep. Here are two treatments—one internal, and one external. 2. Take a hot bath. A hot bath removes the day’s residue, relaxes the muscles, soothes vata, and induces sleep. 3. Take an herbal sedative. Mix equal parts of powdered tagara, valerian, and chamomile. Put 1/4 teaspoon of the mixture into a little warm water and drink just before bed. Tagara (valeriana wallichi) and valerian (valeriana officinalis) are vata-pacifying sedatives, and chamomile balances the emotions. 4. Give yourself a 5-minute massage. 5. Make time for yoga. A regular, balanced hatha yoga practice circulates the lymph and blood, tones the channels of elimination, and balances both the endocrine and nervous systems, calming vata and helping the body and mind digest the events of the day. Whether you practice in the morning, afternoon, or at bedtime, yoga paves the way to a good night’s sleep. 6. Do a relaxation practice. As you become more advanced, there are a number of other systematic relaxation practices that train the mind to focus on and relax different parts of the physical body and, later, the more subtle energetic body. You can find some of these exercises outlined in yoga manuals. You can also try guided relaxation CDs. Menopause is a powerful transition in a woman’s life and a lot of women are seeking natural support as they undergo this physical and spiritual transformation. The average age of menopause – defined as not having a period for at least 12 months – is 51. Perimenopausal symptoms often begin in the 40s or even earlier. It is a personal journey so experiences and timings may differ and it is for each woman to explore in their own way. Menopause is a natural shift in hormonal status. The symptoms are seen when there is a drop in oestrogen production in the ovaries, the adrenal glands will compensate for this drop in oestrogen and any adrenal exhaustion is best addressed to ease this transition. Oestrogen contributes to the female menstrual cycle by building endometrial tissue, sustaining bone density and the nervous system, maintaining the quality of the skin, sustaining libido and for the regulation of the female reproductive system. This is a time of deep questioning about your life, relationships, job, home, what you are doing with your life and the calling you receive in terms of what you wish to accomplish as you move into the next phase of your life. This is a time of death and rebirth. You are releasing what no longer serves you and birthing the new YOU. You may be called to spend time alone, you may sense your power rising and no longer wish to accept what others say, you may experience heightened sensitivity. This is a time of deep healing, healing your body and past traumas. You will be called to develop self acceptance, to de-clutter your life and to develop strong self care practices. There is no right or wrong way to transition through your menopause. Here are a few holistic tools that may support your journey. Simply eating more plant foods such as legumes, vegetables, fruits, whole grains, nuts, and seeds can offer some relief, as they contain hormone-balancing plant chemicals known as phytoestrogens. Ground flaxseeds also contain phytoestrogens and have been shown in studies to reduce hot flashes. In one study, women had hot flash relief when they consumed 40 grams of ground flaxseeds daily. Fermented soy foods such as tofu, miso, and tempeh can also help reduce hot flashes. Increasing your antioxidant intake greatly helps the entire body and brain. Unprocessed brightly coloured fruits and vegetables, high quality proteins, grains and oils help to maintain healthy levels of antioxidants. The benefits are wide spread and positively impact on memory, mood, heart health, blood pressure, detoxification, sleep, stress tolerance, thyroid, cancer risk, osteoporosis and more. Studies have shown that menopausal women were found lacking in Polyunsaturated fats (PUFA). Healthy choice PUFAs are found in fatty fish like salmon, herring, trout, mackerel and tuna. It is also found in walnuts, flax, chia and sunflower seeds. Take time to review your mineral intake and possible deficiencies. Deficient nutrients may be iron, copper, zinc, potassium, calcium, magnesium, vitamin C, D, and K. Magnesium is critical for energy production, bone structure, sleep, mood, and brain health. Review your sodium and phosphorus intake which may be too high particularly if consumed via processed foods. Ensure proper hydration as there is a chance of electrolyte imbalance and dehydration when experiencing heat symptoms. You may wish to review, reduce or stop your caffeine and alcohol intake. Dr Wilhelm Schuessler, a great nineteenth-century German physician, concluded that there are 12 minerals that must be present in the body to maintain perfect health. Through his research Schuessler developed tissue salts which offer a natural system of nutritional medicine. Tissue salts enable the cells of the body to both eliminate toxins and assimilate nutrition. Tissue salts are completely safe and can be used safely with other forms of medicine and treatments. Tissue salts help with the physical, emotional and mental journey through the menopausal years. Calc Phos, Kali Phos and Nat Mur smooth the emotional path, balance the hormones and strengthen the heart muscle. Calc Phos and Kali Phos will also minimise the discomfort of hot flushes and night sweats. Silica is a general tonic with Calc Fluor rejuvenating the skin and helping to prevent prolapsed and excessive relaxation of blood vessels that can lead to varicose veins and haemorrhoids. Tissue salts to clear stagnation and cool the body are Silica and Nat Phos. Purchase Tissue Salts for Menopause or consult with a homeopathic doctor for suitable Tissue Salt remedies. Herbs can also alleviate menopausal symptoms. Black cohosh has been shown in numerous studies to relieve a multitude of menopausal symptoms including hot flashes, anxiety, insomnia, heart palpitations, and depression. Maca root has a rich history of use in Peru to help women through the menopausal transition. Several double blind, placebo controlled studies show that it can indeed help hot flashes and a variety of other menopausal symptoms. Another unique herbal extract is red clover. According to research, this effective alternative treatment for menopause works to relieve hot flashes, vaginal dryness, and anxiety. Sage is a traditional remedy to cool the blood and reduce heat in the body. Try sage tea. Chamomile tea also has a cooling effect on the body. Hormone modulating herbs to address the decline in estrogen are Ashwaganda, Black Cohosh, Kudzu, Anemarrhena, Horny Goat Weed, Morinda, Dong Quai, Chaste Tree, Paeonia and Curculigo. It is recommended to find a naturopath or herbalist to advise on herbs for your particular symptoms and situation. Homeopathy is a useful remedy to reduce menopausal symptoms and consulting a homeopathic practitioner is highly recommended. One of the most common remedies is Sepia. Symptoms that suggest this remedy include hot flashes, night sweats, vaginal dryness, irritability, low libido, and exhaustion. Another common remedy to consider is Pulsatilla. Women who may benefit from this homeopathic medicine feel worse in warm weather and desire fresh air. They may have mood swings and weepiness and feel better with company. Answer the call to spend more time alone in a process of withdrawal. This is a time to deeply listen to your inner knowing. Solitude allows you to truly listen to your inner wisdom. In this process you may wish to spend more time in nature, journal writing, meditating or doing whatever feeds your soul. This is a time to say NO and to put your needs first. Review and implement an exercise plan to support your self-care programme. Do the things that you enjoy and that you are encouraged to make exercise a central part of your life perhaps even revisiting things that you enjoyed as a child such as swimming, cycling, walking, dancing, yoga, pilates. Yoga & meditation helps to reduce nervous system stimulations which can aggravate hot flushes. Select whatever exercise brings you joy. Breath work is an effective way to cool, calm or invigorate during the experience of hot flashes or anxiety. Yogic breathing is a way to bring extra energy into the body or bring in a sense of relaxation. Breathing exercises help to de-stress the body and mind acting to soothe the whole system. Anuloma Viloma (Alternate Nostril Breathing) helps to calm the body & mind, soothes the system and assists if you are suffering from disturbed sleep. Try 10-15 minutes per day. This breathing technique consists of breathing through alternate nostrils and retaining the breath. Anuloma Viloma harmonises the nervous system and balances both hemispheres of the brain. Every two hours the activity of the brain shifts from one hemisphere to the other. The same occurs with the lungs and this technique helps to balance the lungs. This practice stimulates the nadis or energy channels that run throughout the body like electrical wires. It is performed with a breathing sequence of 1:4:2. The breath retention gives more time for the exchange of gases which means you will get more oxygen in the blood and increased expulsion of carbon dioxide. At different times of the day and also dependant on our health, we will breathe more effectively through one nostril versus the other. Observations during this practice help us to tune into our body and mind with greater awareness. Anuloma Viloma is a more advanced breathing technique and controls your prana (energy) through the control of the breath. This technique can be practiced every day. This technique is for 4:16:8. Always start and end on the left side. Come into an easy, comfortable seated position. You may wish to sit on a cushion or yoga block. With your spine tall and your shoulders relaxed, begin by focusing on your breath. Taking full deep breaths in and out of your nose. Place your left hand in chin mudra (thumb and index finger touching) and rest on your left knee. Bring your right hand into Vishnu mudra (curl your index and middle finger into the palm and leave your thumb, third and fourth fingers free). Close your eyes. Take 3 deep breaths in and out. Place your right thumb up to right nostril and close this nostril. Breathe in through the left nostril for the count of 4. Close both nostrils using the thumb on the right nostril and third/fourth fingers on left nostril. Maintain a constant pressure on the nostrils and hold the breath for the count of 16. Release the thumb to open your right nostril and exhale slowly until the lungs are empty to a count of 8. Inhale on the right (same side) for the count of 4. Close both nostrils and hold for the count of 16. Open the left nostril by releasing the fingers and exhale for a slow count of 8 until you have completely emptied the lungs. Repeat for up to 8 rounds remembering that a round always starts and end on the left. Keep the practice smooth and effortless. Precautions: The retentions should not be performed by those with high blood pressure, cardiac patients or pregnant women. If the 4:16:8 count is too much to start with, try 3:12:6. As you develop this practice you can increase the counts from 4 to 5, 5 to 6. Remember to take time to develop your practice and make sure that you feel comfortable at all times. Sithali Breath is a useful technique to manage hot flushes and rebalance the body. Also supportive when you are feeling drowsy in the morning or during an afternoon slump when you need to improve your focus. To practice Sithali, you need to be able to curl the sides of your tongue inward so that it looks like a straw. The ability to curl the tongue is a genetic trait so an alternative is given below. Sit in a comfortable position, either on the floor or in a chair, with your shoulders relaxed and the spine tall. Stick the tongue out, curl the edges of the tongue inward to make a straw-like shape. Inhale through the tongue, close the mouth and retain the breath for as long as feels comfortable. Exhale through the nose. Repeat for a minimum of 10 breaths. Make sure you feel fully comfortable at all times and your breath flows easily. Another technique if you cannot curl your tongue, extend your tongue out flat and sip the air across the upper surface of your tongue. Bhramari Breath (Honey Bee Breath) is a simple technique to instantly calm the mind and help with concentration. It is one of the best ways to free the mind of agitation, frustration, anger and anxiety. The exhalation of this technique resembles the humming sound of a bee. Bhramari breath is very healing and relaxing and is a useful tool to relieve sleep issues, headaches, migraines and stress. The sound vibrations calm your nerves and have a particular soothing effect on the brain and forehead. Use Bhramari breath if you are feeling a little hot or experiencing a hot flush. This technique can be used at any time. Use as an instant way to de-stress yourself. You can practice 3-4 times a day and also you can include it in your asana practice or as you prepare to settle the mind for meditation. If you are having trouble sleeping, practice this technique a few times in bed as you settle. Come into a comfortable seated position or lie on your back, close your eyes. Connect in with your breath, notice the sensations in your body and check in with your mind. Take a deep inhalation and as you exhale make a loud humming sound like a bee. You can vary the pitch of your humming sound and when you do connect in with the body to sense the vibration within the body. Inhale again and repeat this 3-4 times. Menopause is a physical, spiritual and emotional transformation. Meditation can be a source of relief and a supportive tool during this time of great change. Meditation calms the mind, brings clarity and focus, restores inner peace and balances mental focus. Irritability and depression can be greatly eased by a regular meditation practice. Guided chakra meditations can support shifts experienced within the energy body during the menopause. Meditation can be used as a way to explore your inner depths, find greater meaning and process the changes occurring during the menopausal years. You will emerge wiser, more intuitive and in your full power. Regular short naps can help you reduce stress, boost your alertness and energise you. There are a few tips to successful napping to ensure that you do not wake up in a groggy state. A 20 minute snooze is a great way to power nap and enhances your motor skills and attention. A 60-90 minute nap brings Rapid Eye Movement (REM) sleep which helps make new connections in the brain and boosts creative problem solving. Regular short naps help to lower tension which decreases your risk of heart disease. Stick to a regular napping schedule, set your alarm so that you do not over-nap and optimal times are between 1-3pm, nap is a dark room to make sleeping easier. Napping is a natural way to revive your energy and may prevent you using caffeine in the afternoon or evening which can affect your night-time sleep patterns. Naps can help avoid burnout and reverses information overload. Snoozing during the day helps to make up for any lack of sleep experienced at night. Sleep is the most effective approach to high adrenaline levels. Many women require eight to ten hours of sleep to function optimally. Try getting to sleep on the earlier side of midnight as it is much more restorative to your adrenals than sleep that begins later in the night. Try Yoga Nidra to support your sleeping needs. Yoga Nidra is an ancient tantric method where the mind and body is in deep relaxation. A single hour of Yoga Nidra is as restful as four hours of conventional sleep. This practice is fully guided so perfect for complete beginners or more experienced practitioners. On a physical level Yoga Nidra improves the quality and the amount of sleep and soothes the nervous system. This is beneficial if you are experiencing exhaustion, night sweats, disturbed sleep, insomnia or are generally feeling tired. For details of my Yoga Sleep, Yoga Sleep for Children and Meditation Mix CDs and downloads please visit my online shop. Downloads also available via iTunes, Amazon and on streaming sites such as Spotify. Weekly guided meditations are now uploaded to my YouTube Channel. My ongoing journey called me back to the Jungle Ashram. 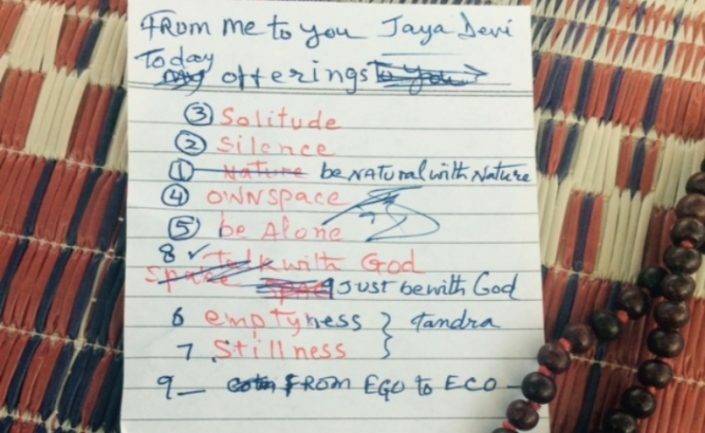 I was needing to return to this ashram, spend time in silence and connect more deeply to nature. We live in a busy frenetic world and my inner knowing was asking me to dive more deeply into my practice. To slow things down, take some time out and spend time in contemplation. 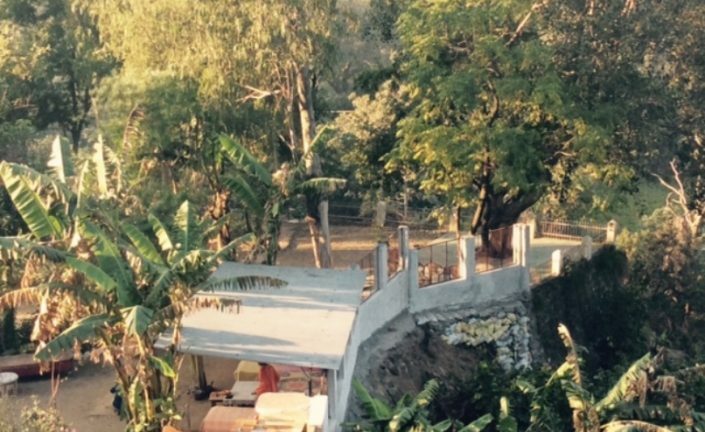 I had visited this ashram on many occasions for short visits but I wanted the opportunity to spend time with Sri Swami Balyogi Premvarni and in this oasis of tranquillity. The ashram programme consists of daily asana practice, meditation, pranayama, Yoga Nidra, Tandra Yoga, daily fire puja, satsang with Premvarni, self study, reading and silence. By practising mauna, total silence, each day keeps the mind calm and relaxed. The outward mind can turn inward for self-introspection. Silence brings us into direct connection with our true self, our conscious awareness, our divine nature. This practice also opens us to the energetic relationship with others and the universe. This jungle ashram is a wonderful place to connect with nature as it is all around. Birds, monkeys, peacocks, squirrels, ants, elephants… The jungle was alive with the sounds of nature. The more I stepped into the place of silence the more I became connected with my surroundings and the ‘oneness’ with nature. We are increasingly over-stimulated by the nature of our daily life and we bombarded by distractions. Retreat and silence offers a “detox” for the body, mind and soul. We can remove the distractions, allow the mind to clear, go into the space of inner stillness and silence, gain balance and clarity. Over time we can understand our true potential in order to fully flourish in life. This was a gift of retreat, silence and self-reflection. A time to focus inwards, no demands, just time to be and reflect. Silence and slowing down offers the opportunity to listen more deeply to our inner world. It was an honour to experience Sri Swami Balyogi Premvarni’s teachings and to discuss ideas. I had many thoughts, ideas and new teachings to take away with me. The next stages for me are to experience these teachings, explore the teachings and embody them. As I write this I am now back in the UK. Winter is transitioning to Spring, my inner calling is to retreat from the world to take time to integrate these new and deeper learnings. I am reading more widely on the topics explored, continuing with my practice of silence and meditation. And so the journey continues…..
Yoga Retreat at Suryalila, nr Seville in May 2017 – Early Bird Offer! * EARLY BIRD OFFER: Book by 31 December 2016 and receive £50 discount on the listed prices. Due to requests, we have now opened up a Non-Yoga participant option (shared room). Non-yoga participating guests can still enjoy the great food, stunning location and ambience of our yoga retreat. There is plenty to do for those not attending classes such as hiking in local area, taking day trips, horse riding, spending time by the pool, visiting the sauna, booking a massage and of course taking time to rest. Join Julie Bladon (Jayadevi) and Jackie Dorrian (Jagdambe Ma) for this blissful 7 night yoga retreat. We will explore our yoga practice, meditate, activate & deepen our connection to our inner self. This is the perfect time to switch off, detox and take time for you. Our mixed programme is perfect if you are starting your yogic journey and wish to explore different styles or if you are more experienced and wish to immerse yourself in your practice. 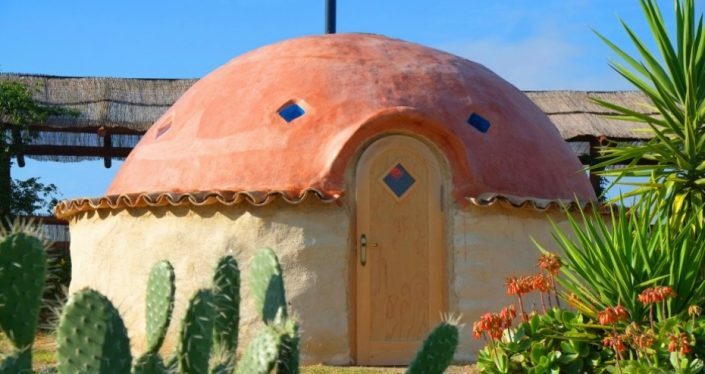 Our Yoga Retreat will take place at Suryalila Yoga Retreat in the heart of the Spanish Andalucian Hills, Southern Spain, close to the charming villages of Arcos de la Frontera and Prado del Rey. You may travel as a group or solo but it is guaranteed that you will meet like minded people on retreat. Retreats are perfect if you are travelling alone, you have the choice to spend time with others or enjoy your own space if you wish. This retreat is led by two experienced yoga teachers: Julie Bladon (Jayadevi) and Jackie Dorrian (Jagdambe Ma), who will teach yoga classes in a variety of styles including Akhanda Yoga, Kundalini Yoga, Yin Yoga, Restorative Yoga, Sivananda Yoga and Yoga Nidra. To book please complete the booking form below and a deposit of £200 is payable. An early bird discount of £50 off the listed prices is available for all bookings made by 31 December 2016. Full balance due by 31 March 2017. Monthly payment plans are available, please ask for details. EARLY BIRD OFFER: Book by 31 December 2016 and receive £50 discount on the above listed prices. * The cost includes yoga activities, three delicious gourmet vegetarian meals a day and the use of the retreat centre facilities. Non-yoga participant price excludes all yoga activities. https://juliebladon.com/wp-content/uploads/2016/11/ganesha-yoga-shala-suryalila-web.jpg 494 806 Julie Bladon https://juliebladon.com/wp-content/uploads/2016/08/logo_min-green-300x69.png Julie Bladon2016-11-09 11:07:522019-02-06 14:51:42Yoga Retreat at Suryalila, nr Seville in May 2017 - Early Bird Offer! I was recently asked at the end of class if I could recommend any yoga books for beginners. 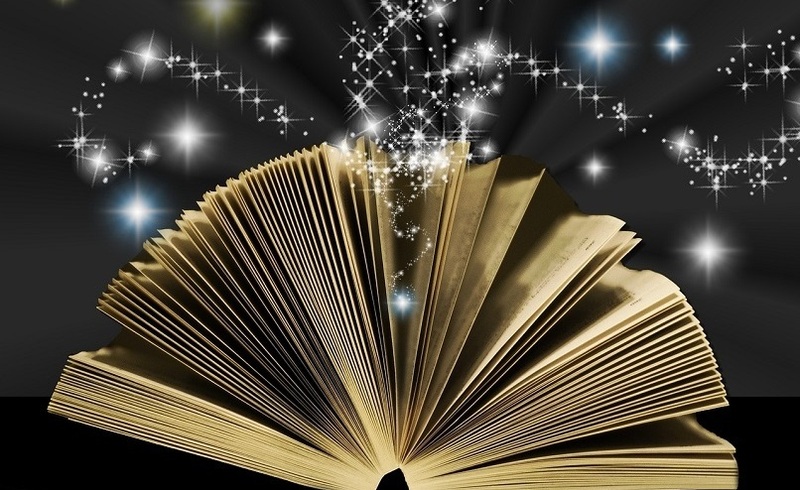 Books are an excellent way to learn and to develop your knowledge so here are 7 recommended books for you. When I first started yoga I remember supplementing my yoga classes with reading by following advice and following the sequences within a yoga book. It is highly recommended to study with a teacher in person when possible but reading is a great way to explore and develop your practice. This was one of the very first yoga books that I owned, given to me as a gift by a friend. This step-by-step guide is a practical, easy to follow book with sequences for everyone. I liked to dive into this book each morning and get inspiration for my practice particularly as it was all so new to me. The philosophy and benefits of Iyengar yoga are clearly explained and there is advice on how to begin and what equipment is needed. There is a chapter on making yoga enjoyable and fun for children. The guide to meditation is useful giving techniques and tips. This essential companion for beginners and experienced yoga remains a classic guide to yoga. The book is an engaging and comprehensive guide to asana, pranayama, meditation, nutrition, relaxation and every aspect of the yogic lifestyle. Swami Vishnu Devananda trained under Swami Sivananda for many years and one day Swami Sivananda gave him a 10 Rupee Note, and his blessings, to travel to the West and spread the teachings of Yoga. B.K.S. 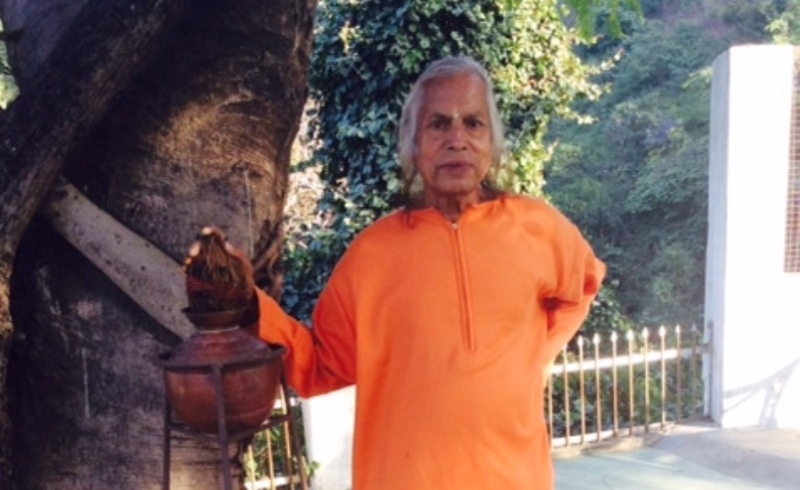 Iyengar devoted his life to the practice and study of yoga. ‘Light on Yoga’ is widely called ‘the bible of yoga’ and has served as the source book for generations of yoga students around the world. It is the classic text for all serious students of yoga. This classic yoga book gives emphasis on precision and alignment which is important for developing a safe foundation for your practice. The book includes step-by-step yoga asana guides; a guide to Pranayama, breathing techniques; and an introduction to the spiritual side of yoga practice. This fantastic book presents 850 yoga asanas in a logical sequence enabling the reader to understand the variations for each posture. The Sanskrit translations allow you to understand the relationship between the name and the spiritual significance of each pose. Detail regarding the energetic essence of each asana is included through the use of a chakra chart and graphic icons for each pose. Presented in a clear way which allows you to creatively explore your practice whilst maintaining a safe home practice. For more than twenty-five years, until her death at the age of 91, Vanda Scaravelli was transforming bodies and lives with her innovative approach to yoga through the proper alignment of the spine. She listened to the body and worked with instead of against it. She used gravity, grounding, and breath to achieve dramatic improvements in health and wellbeing. Scaravelli was an early student of Iyengar. This is not a step-by-step yoga instruction book but a classic inspiring yoga book. The book features three parts – Part One “The Story of Stories” the philosophy of yoga; Part Two “The Asanas” short exploration of yoga asana and Part Three “Breathing”. It is inspiring to see the photos of Scaravelli in the Asana section, showing that yoga is for everyone. She didn’t start yoga until her 40s and the photos in the book are taken in her 80s. This book is an inspirational reminder as to why you are doing yoga. Scaravelli reminds readers that: “if you are kind to your body, it will respond in an incredible way.” “Awakening the Spine” offers a gentle way to achieve and maintain overall health and a naturally supple spine at any age. I’ve included this book as it examines ways to stretch the meaning of yoga beyond the familiar poses and breathing techniques. This book explores yoga philosophy and ways to incorporate it into our everyday life. Judith explains off-the-mat practices to guide you in deepening your relationship with yourself, your family and the world around you. This inspirational and practical book will guide you in a warm and personal way. Covering topics such as Courage, Relaxation, Compassion, Fear, Empathy, Greed, Truth and many more. The book includes practice suggestions and daily mantras for each topic. Breathwork is an important part of Yoga and our overall wellbeing. This is an easy to read book with step-by-step guides for remembering and re-learning our breath. The book includes concise information and diagrams relating to the anatomy of breathing and suggested practices for various health issues such as back pain, tiredness, asthma and help to build stamina. Easy to understand and beneficial for all yogis and non-yogis alike! This list gives you a taster of yoga books available for beginners. I hope that it gives you some inspiration. Why not explore further the wealth of yoga books available to us. Happy reading!